The area was traversed for thousands of years by the Kaurna people before colonists arrived in 1836. Unley was one of the first districts in Adelaide to be opened for settlement in 1837. Over the course of years beautiful villas were constructed in the area that is now known as The Village Green. Through the 1970’s these villas were purchased by the City of Unley and generously made available for community use. At that time the rear gardens were opened up to become what we now regard as The Village Green. Since that time, the natural beauty of the area and the open space has been treasured by Unley residents and the wider Adelaide community alike. Further, it is remains home to the historically significant villa cottages that continue to be used by important groups to provide services and support to the community. These include St John’s Museum, Adelaide Potters Club, the Unley Museum, a Cancer Care Centre and the Unley Kindergarten. Where is The Unley Village Green? The City of Unley Council says it is committed to environmental sustainability and thoughtful redevelopment. If this is true, we ask why the Council plans to demolish historical villas adjacent to the Village Green and build a new 8 storey development including new Council Chambers and 150 residential apartments in its place? Such development will destroy the very essence of what the Council espouses to promote. The Village Green would be lost forever. SOS Unley Village Green is a community action group, not adverse to change and development, but most definitely opposed to the proposed development as it currently stands. Our aim is to lobby Council to revise the proposed plans to bring about a more acceptable and sensitive development that preserves the heritage and beauty of the area. If you would like to receive updates on SOS Unley Village Green action group activities regarding the proposed development, please register here to receive updates about this important community matter. Thank you all who have supported to save the Unley Village Green. We have news. On 30 March 2017, elected members of the Unley City Council voted on the Unley Central Precinct DPA. This included the various critical height limits associated with each area of the central DPA and controversially the shape and structure of the much loved Unley Village Green. As you know the Village Green is the main focus of this community group and we are pleased to acknowledge that the Council agreed with the SOS position to maintain the villas, cottages, the grassed areas. Councillors also agreed with the SOS position that there would be no residential development on this or the rest of the land owned by the Council on the Civic Centre block. In addition, any potential future development to the current Civic Centre would be no greater that 3 storeys high. With respect to the rest of the Unley Central Precinct DPA, the outcome did not totally mirror the SOS position, however we congratulate Councillors for the time they took when attempting to find a balance in a sea of competing views, positions and demands. The Councillors achieved a balance; providing the opportunity for future residential development and associated services within the Central Precinct, while respecting the character and heritage of what IS Unley. Cottages on Edmund Avenue – To be kept as is. Village Green – To be kept as is. The Kindergarten – To be kept as is. The Cottage (Community Services) – To be kept as is. No residential usage on this block – Apart from the existing use of the Church manse. While the Unley Council has made their decisions, we will remain active while the Planning Minister considers this DPA and it is Gazetted as formally ratified. Watch this space. In the meantime, we would ask that you consider removing any SOS Unley Village Green posters down from fences, play grounds and public areas, so that they don’t become a visual intrusion, however please save them for a period to ensure that if the Planning Minister rejects the Council’s DPA, we can reattach them to further this cause. The SOS Unley Village Green Committee would like to extend a huge thank you to everyone who attended the information afternoon that took place on Sunday 19th February 2017. 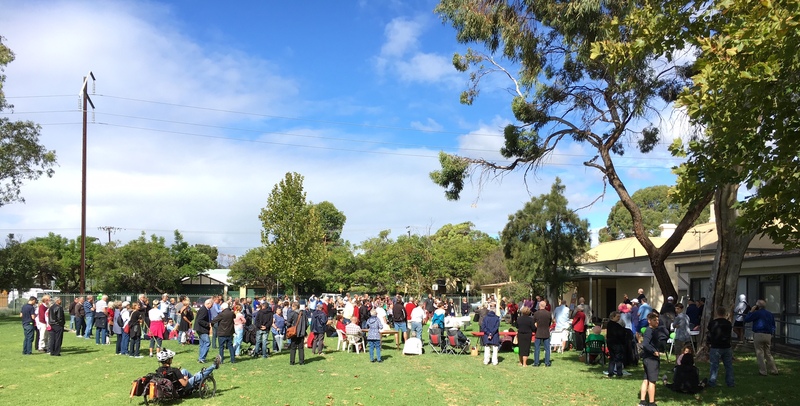 This event, organised by the Friends Of the City of Unley Society Inc., gave the community the opportunity to hear from just a few of the various community groups who use the Village Green. Anne Wharton from Save Unley Trees spoke passionately of the importance of Unley’s significant trees. You can read the background to her speech here: https://sustainablecommunitiessa.org.au/2017/01/18/saving-urban-trees/. The event was a wonderful opportunity to celebrate the beauty and value of the Unley Village Green and surrounding environs, including the beautiful and historic Edmund Street villa cottages. Regrettably this gorgeous open space is under threat from The Unley Central Precinct Development Plan Amendment (DPA). If the DPA Amendment is approved by the City of Unley Councillors, it would open the Unley Central Precinct (which includes the Unley Village Green and the historic Edmund Street villa cottages) and much of Unley Road to buildings of up to 11 storeys. The decision is imminent, as you can see from the City of Unley’s own website: http://yoursay.unley.sa.gov.au/unley-central-precinct-development-plan-amendment. To see a summary of what the Council is proposing as at 21st February 2017, download the brochure from their website here: yoursay.unley.sa.gov.au/unley-central-precinct-development-plan-amendment/documents/42603/download or download from Here. Focus invited Christopher Short, from SOS Unley Village Green Inc., to highlight to the community that Unley residents can only save their beautiful environment by communicating their concerns directly with the Mayor and the Councillors. If the amendment goes through as currently proposed, the heart of Unley is open to massive development on an unprecedented scale that will destroy this beautiful suburb. Already, the Unley Kindergarten, the Adelaide Potters’ Club, the St John’s Museum, the Cancer Care Centre and the Unley Museum have been given notice that they their leases will not be renewed. This of course, will make way for the demolition of these cottages to make way for development. Frighteningly, the City of Unley is proposing a change in the development plan, which would then allow it to approve its own development on its own Council land. This is an outrageous conflict of interest. We have a situation where 13 elected Council officials (some of whom no longer even live within the City of Unley) will make a decision that with result in a complete change in character in Unley – the biggest change since the formation of Unley over one hundred years ago. SOS Unley Village Green Inc. is not opposed to development. But we do believe what is proposed is NOT what the majority of Unley residents need or want. SOS Unley Village Green Inc. believes that the The Unley Central Precinct Development Plan Amendment should be deferred until after the next Council election to be held in 2018. Councillors will then have the opportunity to state their position on the Development Plan Amendment and take that position to the election. We believe that this is the only fair way to give the resident of Unley a say in what will happen to the place they, their children and grandchildren call home. In the meantime, we implore you to contact each and every elected Council member to express your views. You will find below the names and contact details of our 13 elected Councillors including Mayor Clyne. If you wish to preserve and protect our suburbs, please act now. For once what we have is gone, it will be gone forever. We thank Mayor Lachlan Clyne and those Unley Councillors that attended the Unley Village Green Appreciation Day. It did give them the opportunity to see the importance the local community puts on these local icons. Hopefully with your encouragement, this will turn into their positive action to ensure The Village Green’s preservation along with the character of our City.